The folks at the Lansing, Michigan hackerspace built themselves a 40 Watt laser cutter. It’s an awesome machine capable of cutting plywood and acrylic, and is even powered by a RAMPS board, something normally found in 3D printers. They wanted a little more power out of their 40 Watt tube, though, and found pulsing the laser was the best way to do that. Unlike the fancy Epilog and Full Spectrum Laser machines, the Buildlog.net 2.x laser cutter found in the Lansing Hackerspace didn’t use Pulse-Per-Inch (PPI) control until very recently. When a laser tube is turned on, the output power of the laser is much higher – nearly double the set value – for a few milliseconds. By pulsing the laser in 2-3 ms bursts, it’s possible to have a higher effective output from a laser, and has the nice added benefit of keeping the laser cooler. The only problem, then, is figuring out how to pulse the laser as a function of the distance traveled. To do this, the laser cutter must accurately know the position of the laser head at all times. This could be done with encoders, which would require a new solution for each controller board. Since laser cutters are usually driven by stepper motors controlled with step and direction signals, a much better solution would be to count these signals coming from the CNC computer before it goes to the RAMPS driver, and turn the laser on and off as it moves around the bed. A few tests were done using various PPI settings, each one inch long, shown in the pic above. At 200 PPI, the laser creates a continuous line, and at higher PPI settings, the lines are smoother, but get progressively wider. The difference between PPI settings and having the laser constantly on is subtle, but it’s there; it’s not quite the difference between an axe and a scalpel, but it is a bit like the difference between a scalpel and a steak knife. It’s an impressive build for sure, and something that brings what is essentially a homebrew laser cutter a lot closer to the quality of cutters costing thousands of dollars. Awesome work. [Thomas Pfeifer] has taken the PPM signal produced by model aircraft wireless controllers, and with an ATMega8, converted the signal to act as a USB joystick. 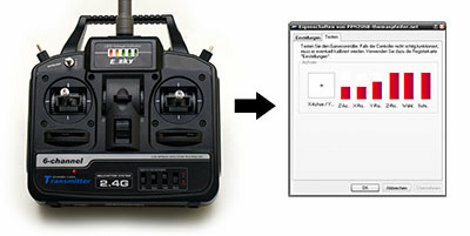 Which means you can now use a standard R/C remote control to fly model aircrafts on your computer. Of course now with PPM decoded you could also use the signal to control any electronic device. Like your mower, iPod, and we’ve even seen remote controlled pellet guns. Catch a video of [Thomas] flying a simulated quadrotor helicopter after the jump.